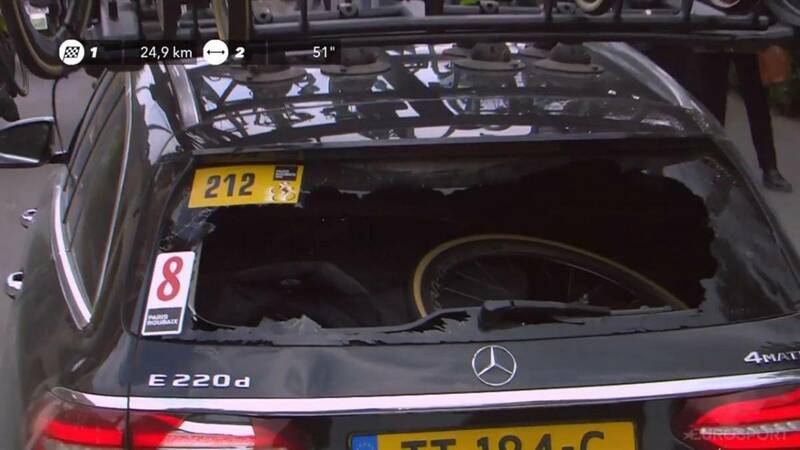 Home Cycling Benoot collided headlong: "I could break my neck"
Benoot collided headlong: "I could break my neck"
The Belgian had a mishap with the Jumbo car in Paris-Roubaix and had to be transferred to the hospital. He was not older, but he can not be on Sunday at the Amstel. Tiesj Benoot is not having any luck at the moment this season. Ghent, who achieved his only professional victory last season at the Strade Bianche, was on the list of 10-15 favorites for the Paris-Roubaix victory, but an accident with the Jumbo team car eliminated him from the And in a moment, the Jumbo-Visma car was in front of me and all of a sudden it closed everything I could not stop and I went straight to it The window was completely broken A motorcyclist who was my back also crashed because he tried to get away from me and then it fell on me. When I was on the ground, I felt a lot of pain everywhere, "said the 25-year-old Belgian at Nieuwsblad..
" My condition was good , so I was disappointed, but I also realize that it could have been much worse, I could have broken my neck easily. I do not blame anyone, that driver did not do it on purpose, "he said. He was discharged but on Sunday he will not be able to be in the Amsteld Gold Race. "Spring for me is over now" .